California’s old-growth coast redwoods (Sequoia sempervirens) spark a calling for many. The tallest and some of the oldest living organisms on earth, ancient coast redwoods offer a connection to nature that transcends the human scale in both size and time. It’s no wonder the massive trees, some reaching heights upwards of 400 feet, are considered guardians of the forest and hold an ethereal ecological presence one could only command in time. Prior to commercial logging along the west coast, ancient redwoods inhabited much of coastal northern and central California, even extending north into southern Oregon. Sadly, much of the original old-growth was felled in the late 19th and early 20th centuries, spurred by the boom in development of west coast cities. Despite this, some impressive pockets of old-growth redwoods remain. Protected today as Endangered Species under the IUCN, all known ancient redwood groves inhabit areas that have led to the formation of state and national parks. In these places, the public can experience the beauty of these majestic flora first hand. California's far northwestern corner is where the highest concentration of old-growth coast redwoods exist, in Del Norte and Humboldt Counties, within a series of interconnected and co-managed parks collectively called Redwood National and State Parks. From north to south the parks include Jedediah Smith Redwoods, Del Norte Redwoods and Prairie Creek Redwoods State Parks in addition to Redwood National Park, which covers the largest but also the most remote areas of remaining old-growth redwood habitat. For those interested in visiting the redwoods for their first time or looking to make a long weekend trip to see the coastal giants, Redwood National and State Parks is the perfect place to start. We’ve pulled together a three day itinerary offering ideas and some exploratory suggestions, oriented north to south. Predictably, summer experiences the biggest crowds in the parks; camping reservations are strongly encouraged. Alternatively, take advantage of northern California's mild coastal climate and visit the redwoods during the shoulder seasons or winter, when you may very well find you have one of these magnificent redwood groves all to yourself. Boy Scout Tree Trail in Jedediah Redwoods State Park. Photo by Kyler Smith. 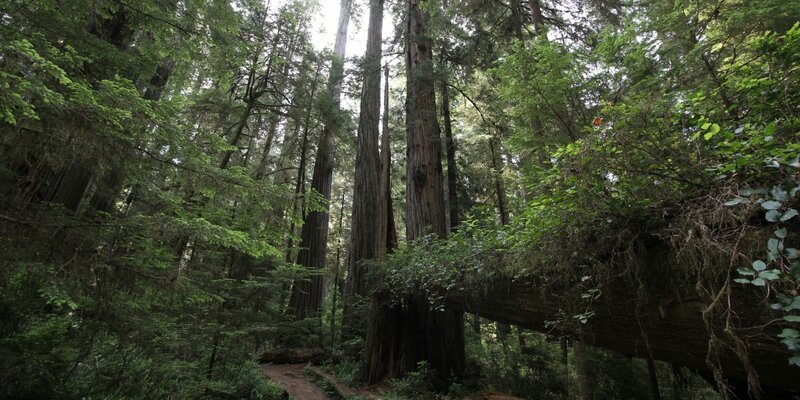 There's no better place to begin your redwood excursion than Jedediah Smith Redwoods State Park, the oldest of Redwood National and State Parks, located east of Crescent City along Higway 199. Drive a loop around the park ending at Jedediah Smith Campground (peak season reservations recommended). 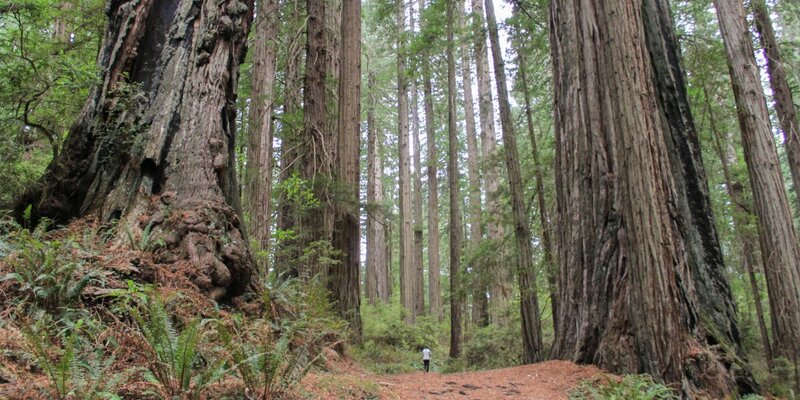 Explore Stout Memorial Grove off unpaved Howland Hill Road in the morning hours to experience this majestic setting at a quieter time, then continue onto the Boy Scout Tree Trail. Continue along Howland Hill Road to Crescent City. Save Crescent City for the following day and return to Jedediah Smith Redwoods via Highway 101 and 199. Before heading to the campground consider another walk through the Lieffer + Ellsworth Loops and/or Simpson Reed Grove. Head to the banks of the Wild and Scenic Smith RIver for a night of sleep under the redwoods at Jedediah Smith Campground. An alternative campground option is located at Florence Keller County Park, where Highway 199 runs into Highway 101. Coast Redwoods tower above Damnation Creek Trail. Photo by Aron Bosworth. Continuing south, you'll be heading through Crescent City. Since you're in the area, take a couple of hours to explore Crescent City's historic lighthouses and scenic coastline. North of town, Point St. George Heritage Area offers a beautiful coastal park with rich Tolowa Dee-ni' history and impressive views of the surrounding coastline, offshore islands and Point St. George Lighthouse. Battery Point Lighthouse, constructed in 1856 and one of California's earliest lighthouses, is adjacent to Crescent Harbor and is only accessible at low tide (tours available). Head south from Crescent City into Del Norte Coast Redwoods State Park. Perhaps the best trail in the park affording both access to old-growth redwoods and an ocean view at trail's end is the 4-mile out-and-back Damnation Creek Trail. Most of the large trees grow in groves within the first mile of trail, which is relatively flat, albeit a bit noisy from 101 traffic. Fair warning: the second mile of trail descends 1,000 feet to the Pacific Ocean, so make sure you're ready for the hike back out. Continue south to Prairie Creek Redwoods State Park, stopping at Big Tree Wayside along the way. Big Tree is one of the largest old-growth redwoods in Prairie Creek. Set up camp at Elk Prairie Campground (peak season reservations recommended). Fern Canyon in Prairie Creek Redwoods State Park. Photo by Aron Bosworth. Prairie Creek Redwoods offers perhaps the most diversity within the parks. Use the early morning to walk through Elk Prairie keeping on the lookout for Prairie Creek's regal Roosevelt elk. Continue south to Elk Meadow, another preferred grazing area where the elk are commonly seen. Drive unpaved Davison road down to Gold Bluffs Beach, setting up camp early at Gold Bluffs Beach Campground (peak season reservations recommended). Enjoy the beach setting until you are ready for a drastic change of scenery. 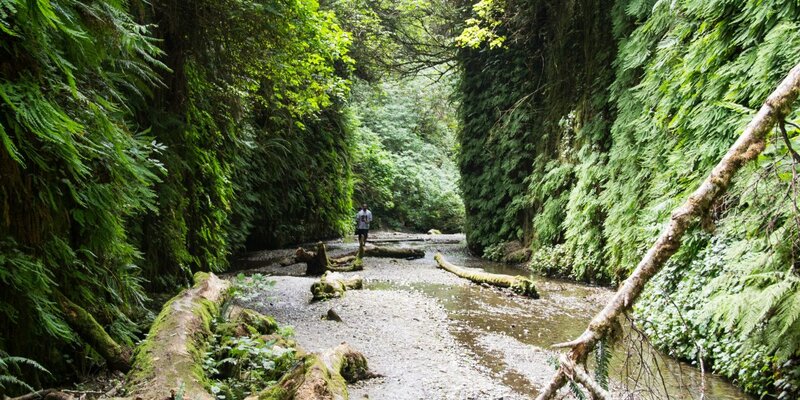 A mile north of the campground is the trailhead for Fern Canyon, a lush and verdant hanging garden-like canyon covered with ferns and mosses. The trail within Fern Canyon proper continues for a mile before climbing up onto the canyon rim. Return along the canyon rim to Gold Bluffs Beach for a night of beachside, fire-lit camping.